Welcome to Part 6 of "Mattel schools DC Direct," a continuing comparison of the ways in which even an old company set in its ways can really compete for fans' dollars by stepping up to face a new challenge. 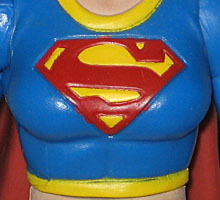 Even before Mattel's first Supergirl figure hit shelves, word had reached the fans about a repaint. The popular guess was Kara in her current costume; and hey, that was right! Of course, the variant was also due in summer of 2006, so it's about a year late at this point. Kara Zor-El was sent from the doomed planet Krypton to Earth. Reunited with her cousin Kal-El, she has begun adapting to her new home, powers and responsibilities. Comicbooks are just like any other field: different creators get different treatment, often for entirely unclear reasons. In 2002, Peter David wanted to use the Silver Age Supergirl, Kara Zor-El, in a storyarc in his Supergirl comic. For those not in the know, at that point, the Supergirl character was some odd conglomeration of a protoplasmic alien, a human girl and an Earth-born angel, because this was during the "Superman must be the only survivor of Krypton" period that DC went through. Anyway, PAD wanted his Supergirl to have an adventure with the "real" Supergirl, but was told by the powers that be that there was zero fan interest in Kara Zor-El. They begrudingly let him use the character for a six-issue arc, but that was it. Two years later, however, Jeph Loeb wanted to reintroduce the "real" Kara to the DC Universe, and TPTB fell all over themselves to not only allow him to use her, but to hype the hell out of her return. During the Superman/Batman "Public Enemies" storyline, scientists discovered a huge kryptonite meteor headed for earth. Captain Atom flew a rocket into space to destroy the rock, which then rained shards of multi-colored Kryptonite all over Earth. While collecting pieces, Batman came across a Kryptonian shuttle, and the girl who had been inhabiting it. This new Supergirl figure is built on the same basic body as her earlier counterpart, of course, but with some substantial differences. Most notably, the head is entirely new. Yes, not only does she have a new, wind-swept haircut, but she got a new face, as well. The jawline is slimmer, the nose is a bit sharper and the features are, overall, slightly more detailed. It's up to you to decide if that's a good thing: in the comics, Kara is just 17 (as Hal "Get 'em While They're Young" Jordan kept reminding himself), so this one might look too adult. Below the neck, the torso and hips are the same, but not much else. Supergirl has new shoulders, arms and hands, and new shins and feet. There have been a lot of complaints about Kara's midriff-baring costume, considering her age, but it's really not that much different than what a girl her age woud be wearing in the real world today. The shirt features yellow trim around the neck and hem, and long sleeves that spill down over her wrists. The skirt has a yellow band around the top - is that supposed to be a belt? The boots are now the standard superhero slip-on style, with more yellow trim around the angular top. Articulation is nearly the same: she still moves at the head, shoulders, biceps, elbows, wrists, chest, hips, thighs, knees and ankles. No boot tops, this time, since they're not straight across, and the biceps joint is at the bottom of the shoulder, rather than in the middle of the arm. Her left leg seems to be longer than her right, leaving her somewhat lopsided if you have them both straight. And again, while it would have been neat if Mattel had made her torso a balljoint instead of a swivel, but that's just daydreaming. Blue Supergirl has the same folded rubber cape as White Supergirl, and it still works for her. The figure is a nice 6" tall, because it would be silly to correct the size problems now. DC Direct released their version of this Supergirl in the notoriously abominable Superman/Batman: "Return of Supergirl" line. Their figure looked absolutely hideous, as sculptor Big Chief tried to emulate Michael Turner's artwork and gave us four of the most god-awful eyesores ever commited to plastic. Maybe it's just that Moore Action Collectibles made it look so easy, back when they made some truly beautiful Michael Turner figs in the late '90s - MAC did Witchblade, Fathom, Magdelena and a whole slew of others, and those all looked great. DCD's try, though? Not so good. Mattel pretty much schooled DCD just by virtue of the fact that their Supergirl looked... presentable. Not like it had melted in the sun. One major problem that Mattel has to overcome is its distribution. In a blog post back in March, our own Monkey Boy commented on how this Supergirl wasn't going to be hard to find, how she would be in plentiful supply. Well, here it is June, and the first rare samples have finally appeared on shelves. So, yeah, Mattel is repeating their MotU mistakes, shorting the figures that should be plentiful in favor of shelf-clogging variants and repaints, and once again it's the fans who suffer. If you want a Blue Supergirl or a Mongul, you still need to sell your soul to a scalper or pray for a miracle. Mattel's figures may regularly out-do DC Direct's, but that doesn't mean squat if no one can find them.